This Dry Chemical Fire Extinguisher is there when you need it! This automotive commercial-grade Purple K 2.5Lb hand held unit is excellent for extinguishing fuel, or electrical fires. Mounting ideas include roll bar/cage, floor, or with our VAC Fire extinguisher bracket in front of yoru seat. Includes universal steel mounting bracket to aid in instalation. 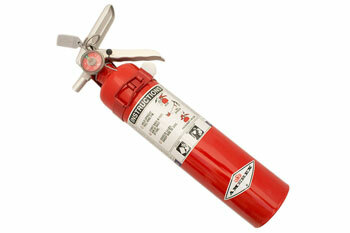 Many events require the safety of a Fire Extinguisher. An extinguisher can save your vehicle in the event of even a small incident such as a fluid leak, or faulty wiring that ignites. Quick access to a quality extinguisher can mean the difference between a small indecent and total vehicular loss.